Our Face to Face Introduction was the morning of Aug 23 2013. 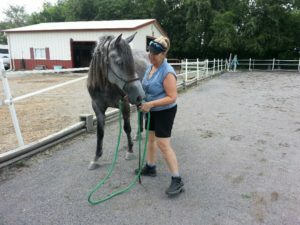 When we arrived at the foster farm, Rhett, who had another name, just had a bath and was squeaky clean. We met while he was standing in crossties. He looked right at me and said ‘’Are you the one that’s here for me?” (It still gives me goosebumps thinking about it.) I looked around at the other girls, looked at Rhett and said , “? ?MEEE?” “Well of course you, goofy, you’re the one who has been talking to me – ALL the time I might add !” he said. What? This didn’t really look like the horse in my dreams. 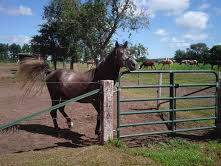 I mean, he kinda looked like him, but this horse seemed cool, cocky and dominant feeling …not my dream horse that was ‘kind, people friendly, I’ll do anything you want of me’ ! 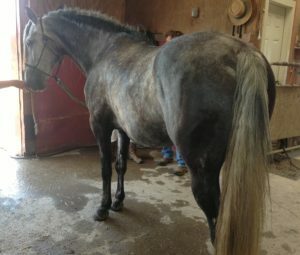 Ok, let’s hear the story of the horse from his foster. She had him about 7 months and it was time for him to move along to his forever home. Oh wait, I almost forgot an important part of how this all started in my dreams. 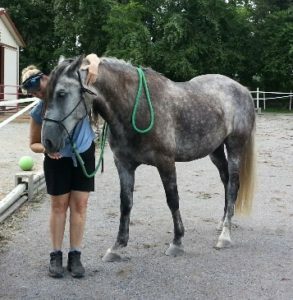 I knew she was fostering him for the Lipizzan Rescue Foundation. Lipizzan? Like the White Stallions that performed all over the world Lipizzan? Ok, maybe he was closer to the horse in my dreams that he looked. I did dream of airs above the ground and defeating the bull! “Lippizzan and what?” I asked. “Reportedly, Andalusian.” Excuse me, did you say Lipizzan x Andalusian? Hello Universe, I think you’ve got the right match here. Andalusian/grey – Lipizzan/white equals Lipizzan – Airs above the ground + Andalusian – Bullfighting = My Dream Horse! My dream is in front of me in a set of crossties! 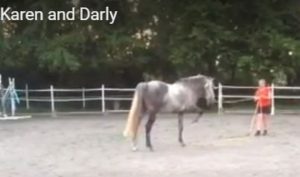 An Iberian that is magnificent to behold, an Iberian that has both the breeds I desire (Life Lesson) and an Iberian that moves…well, he was in crossties so I hadn’t seen him move but I had high hopes! Cause he was my dream horse! about 4 years old. 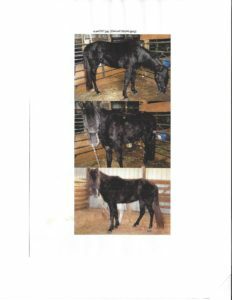 Seems he had a pretty hard beginning, experiencing neglect from about 2 to 4 years old, and then little consistency in his handling including trainers, owners and fosters…from about 4 to 7 years old. “You are the one who will help me heal”. Do you see your ‘lesson’ in this story so far?